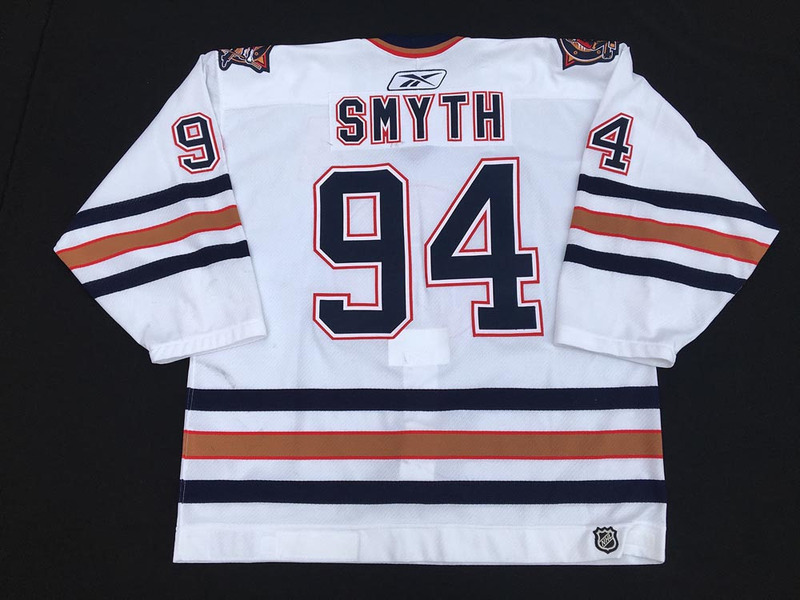 This jersey was worn by Edmonton Oiler and Captain Canada, Ryan Smyth during the first part of the 2005-06 regular season. The Oilers would go on to battle the Carolina Hurricanes in a 7 game Stanley Cup final this season, losing 4 games to 3. 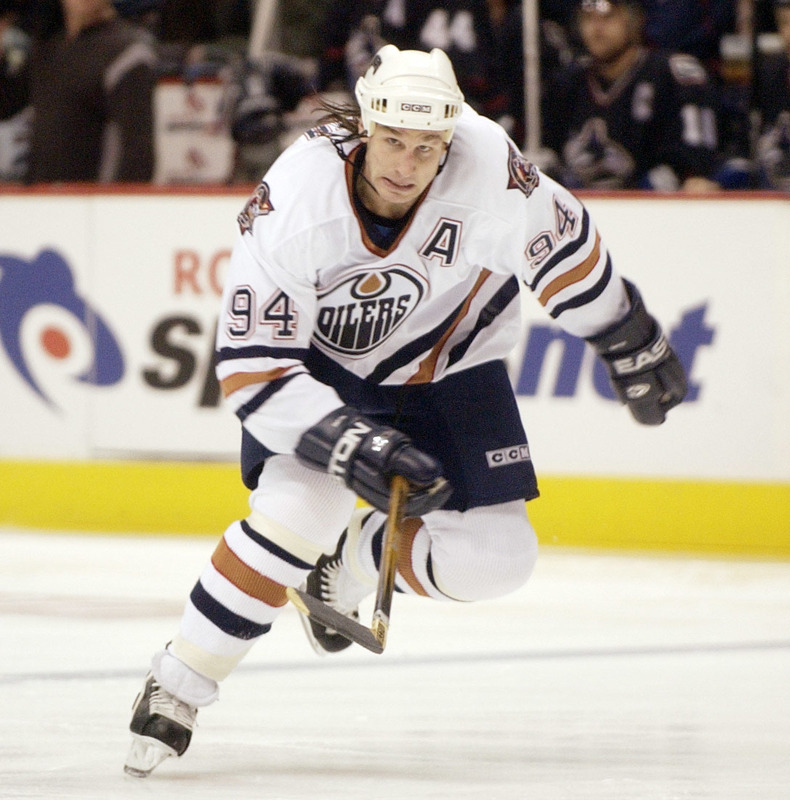 Ryan Smyth was born in Banff, Alberta and played his Junior Hockey in Moose Jaw, Saskatchewan with the Warriors of the WHL from 1992-1995. I was living in Moose Jaw at the time and saw “Smitty” battle with the Warriors over the course of three seasons. He was an offensive force scoring 50 goals in 1993-94. He was selected 6th overall in the 1994 NHL Entry Draft. He quickly became a fan favorite in Edmonton playing a total of 971 games as an Oiler and another 299 games with the NY Islanders, Colorado Avalanche and LA Kings. He is nicknamed “Captain Canada” due to his commitment to his country having played for Team Canada thirteen times and being named Captain 6 times. He was a member of Team Canada’s Gold Medal World Juniors in 1995, Olympic Gold Medalist 2002, World Champions 2003 and 2004, World Cup of Hockey 2004 and 2013 Spengler Cup Winner. I once had a chat with Hall of Famer, Ted Lindsay, who said “ What the Hell was Edmonton doing trading Ryan Smyth. He is a heart and soul guy that only come around once in a while.” I remember watching in person as Smitty lost his teeth in the 2006 Playoffs and came back to set up Shawn Horcoff for the Overtime Winner vs. San Jose. It was classic Smitty. I think Smitty will be remembered as an Edmonton Oiler who gave everything he had for the team and serious consideration should be given to his # 94 being retired. 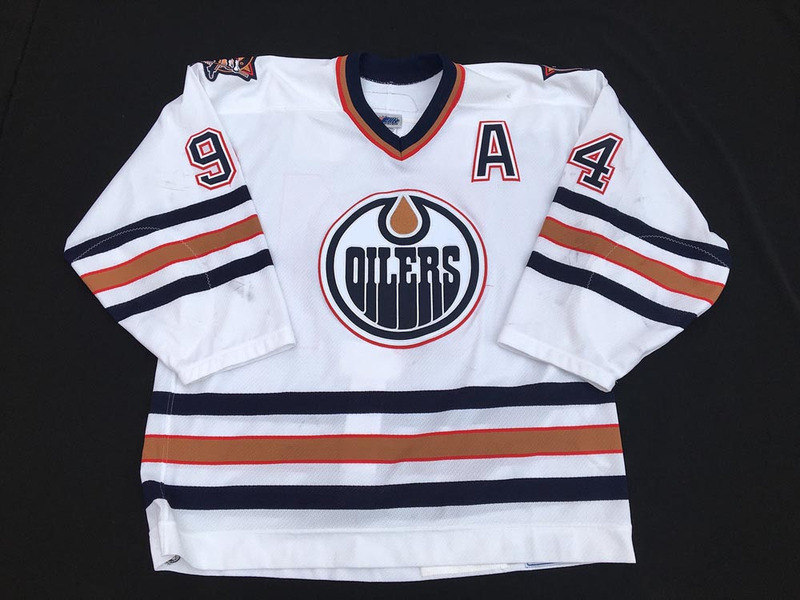 We are proud to display this battle scarred Smitty gamer from a great season in Oiler’s history.